Braven's 855s is a Bluetooth speaker that's perfect if you're after something wireless, rugged, water resistant, and with great battery life. It can also supply very good sound quality, and can even be hooked up to a second Braven speaker for an enhanced stereo experience. 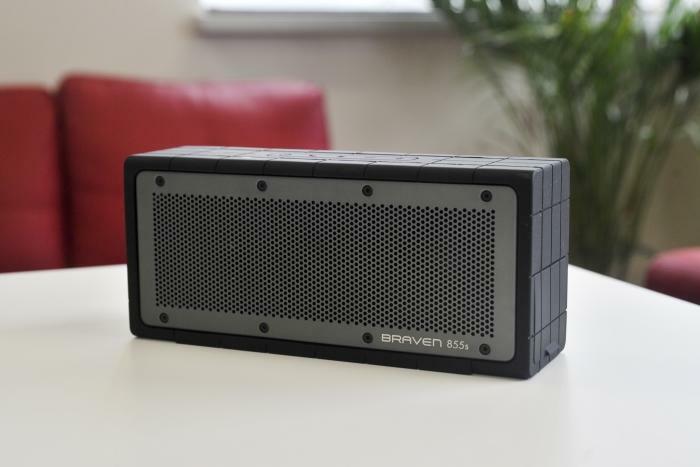 The Braven 855s is not only a Bluetooth speaker, it’s a Bluetooth speaker with a rugged enclosure that makes it water resistant and capable of absorbing everyday bumps. You can easily use this speaker outside, in the kitchen, or even in a workshop without fear of accidental splashes and bumps tarnishing its looks and performance. Most importantly, though, it’s a speaker that produces enjoyable sound. All you really need to get this speaker working is a smartphone, tablet, or laptop with a Bluetooth connection. You don’t even need to place the speaker near a power outlet; it has a large internal battery that can last an entire day (depending on the volume level), and it’s not a big speaker, so you can easily rest it on a small space as long as there is some room behind it for the bass radiators to breathe. Indeed, the Braven 855s is 250mm wide, 75mm deep, 110mm tall, and it weighs 1.52kg. It’s covered in a rubber enclosure that can grip a tabletop, and there are grooves present that can allow water to flow off the speaker, rather than remain on the surface, if it gets wet. A row of buttons resides along the top, and these are what you use to pair the speaker to your device and control the music from your player. There is also a speakerphone button that can allow you to take calls and talk using the speaker’s built-in noise-cancelling microphone. The buttons at the top can be hard to see. You get power, speakerphone, play/pause, and volume/skip buttons. There aren’t any lights or screens to look at — all you see are the aluminium grilles (which are said to be airline-grade aluminium) and the rubber. The grilles protect the speakers and the bass radiators. Along the front there are two speakers, and on the back there are two bass radiators that act in a similar way to bass ports in order to reinforce the sound. The power output is rated at 20W. 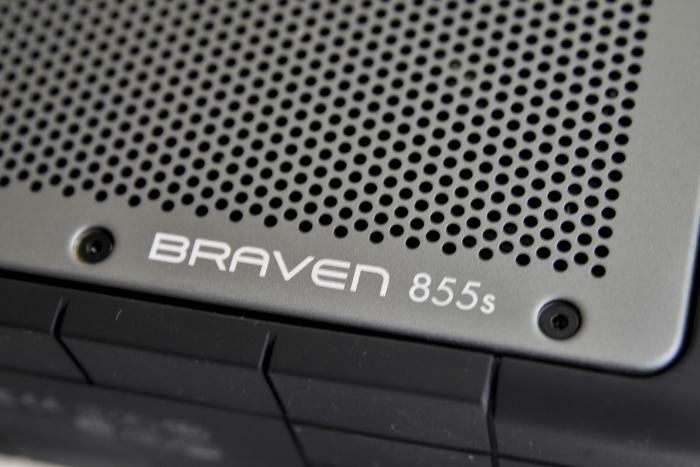 Braven claims the speaker grille is made from 'airline-grade' aluminium. The right side has some ports and a battery level indicator, and these are hidden behind a rubber flap that must be closed in order for the speaker to be resistant to water. Note that the Braven 855s is not designed to be submersed in water. The flap doesn’t provide a super-tight seal; it only acts as a cover so that splashes don’t enter the port openings. Here's a shot of some water flowing off the channels in the rubber casing. The speaker is not submersible, but it will withstand accidental splashes. The ports include a 3.5mm line in facility, power (a full battery charge can take six hours), and full-sized USB. The USB port can be used to charge mobile devices such as phones and tablets, and that’s due to the large capacity of the battery (8800 milliamp-hours). There is also a battery level indicator button; when you press it, a series of lights come on to tell you how much battery power is left. Each one represents 20 per cent. The annoying thing about this particular feature is that the speaker has to be powered on in order for the battery level indicator to work, which seems counterintuitive. 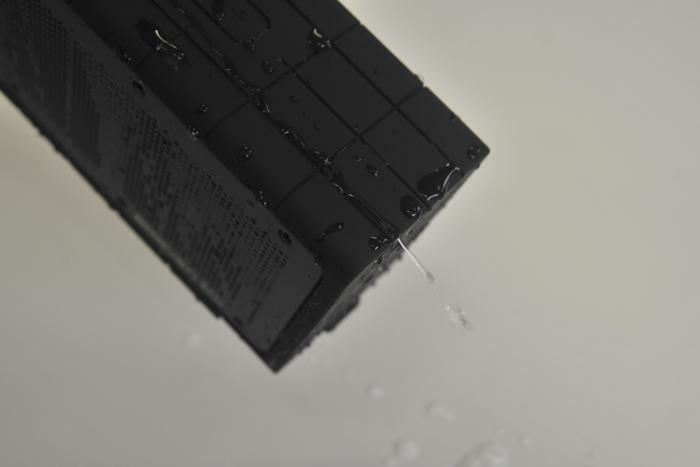 A flap protects the ports from splashes of water. Using the Braven 855s is a piece of cake. Paring can be completed easily by holding down the play button for a few seconds until it emits a sound, and then scanning for Bluetooth devices on your music source. We had no problems connecting to it with a Samsung Galaxy S4 smartphone, and also a variety of Windows 8 tablets and notebooks, even Windows 7 notebooks. If it had asked us for a PIN, we would have had to type in four zeros. On the speaker itself, you can control the volume, pause and play music, as well as skip tracks by holding down the volume buttons for a couple of seconds. Braven has made use of the aptX Lossless codec for this speaker, and we tested using a variety of musical genres. Overall, we found its sound quality to be very enjoyable. Mid-range and high frequencies were accurate and well defined. Even when we had the speaker on a low volume setting we could hear finer details in the music. What was lacking was deep and punchy bass. This was expected considering the small size of the Braven. Instead, rather than being rich in its output, it offered a somewhat flat and short bass response that wasn’t well suited to all forms of music. In particular, bass-heavy music wasn’t ideally matched to this speaker. In saying that, we got used to this characteristic and it was enjoyable to listen to, mainly thanks to the overall clarity and power that the speakers supplied. However, we found the Braven to be better suited to rock and folk music (and a lot of pop music). For these genres, its performance was great. Vocals sounded clear and accurate (Michael Jackson’s ‘whoo' sound was sensational), scratches from fingers moving along guitar strings were audible, and lots of other details in the music were not missed. Furthermore, the sound was loud enough to fill up a regular-sized bedroom and living room. There is an extra setting that you can play with to give the sounds a bit more separation and enhance the stereo effect. It’s called SRS WOW HD and it’s a processor that can be enabled by pressing both the volume up and down buttons simultaneously. We found that it made music sound more spacious, accentuating high frequencies and providing more reinforcement for the bass. It had the effect of adding more body compared to the natural flat sound that we were used to. Perhaps the most exciting feature on the Braven 855s is its ability to be connected to a second Braven speaker so that one speaker becomes the left stereo channel, and the other becomes the right stereo channel. You can use either another Braven 855s, or a Braven 850, which is the non-rugged version of the 855s, and you can place them as far apart as you want (say a few metres) to create a beautiful stereo soundscape that’s better than anything only one of the Braven speakers can do on its own. The two speakers can be linked using True-Wireless technology from CSR. 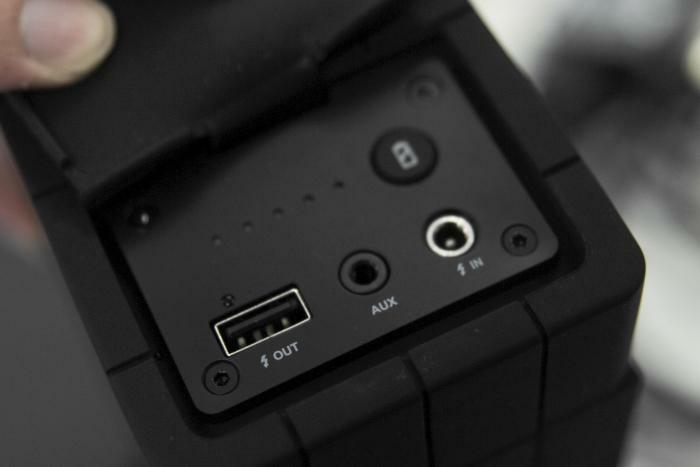 To connect them, you need to disconnect your audio player from each speaker, then press and hold the battery indicator button for a few seconds on both Braven speakers until you hear a sonar-like sound. It takes about 1min before the speakers make their connection, which is confirmed by further beeping after a period of silence. Once the speakers are connected to each other, you can once again connect to either one using your source device. It’s important to note that your two Braven speakers essentially become one device, so you can’t connect different audio sources to both speakers. When you connect to one speaker, that means you connect to both. The speakers will share their controls, which means if you change the volume or press play on one, then the same settings are applied to the second speaker. Apart from allowing you to space the speakers out further to achieve a better, more enjoyable stereo effect, the output also becomes louder. It’s essentially like playing music through a mini Hi-Fi system, but without the bulk of a head unit and the cords that a mini Hi-Fi provides. You can put these speakers anywhere thanks to their wireless nature and excellent battery life. To give you an example, the battery lasted over 23 hours in our tests, in which we played music over Bluetooth at a mid-level volume. The Braven 855s is really good. The build quality is strong, the water resistant finish useful, and these traits make it a speaker that can be easily used in almost any type of home or work environment (it could be a good speaker for a workshop floor, for example). The sound quality is very good overall, though a little flat, but it can be enhanced by using the built-in SRS processor. Furthermore, we love the ability to link the 855s speaker to a second Braven speaker in order to provide a true stereo system. In fact, we enjoyed using it this way and recommend you consider two Braven speakers as a solution if you’re after a stereo system that can be placed almost anywhere in the home and moved around at will. For us, it’s a very capable wireless audio solution, both as far as the versatility of the hardware is concerned, and the sound output. You do have to pay a fair bit, though, and that’s the only hurdle, especially when there are more powerful speaker docks available at cheaper prices. Both the rugged Braven 855s and the non-rugged Braven 850 cost $400 each, which means you’ll be up for $800 if you want to use them as a stereo pair. However, you have to remember that you’re essentially getting a system that is small, easily moveable due to wireless technology, and which can last a long time when running on batteries. In New Zealand, the Braven 855s costs $470, while the Braven 800 costs $450. Without wires, you can place the Braven 855s anywhere and play music from a Bluetooth source. Its battery can last over 20 hours depending on the volume. • Already have a good stereo system but want to listen to music through your phone or tablet? Try these easy-to-use Bluetooth streamers.